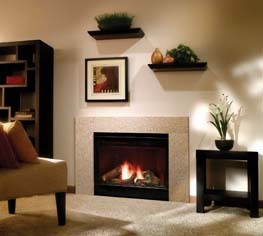 The Eclipse hearth system integrates a fireplace and venting into one easy-to-install, affordable package. At 20,000 Btu/hr input, the Eclipse comes standard in a natural gas or LP model, and a choice of either standing pilot and IntelliFire ignition systems. The unique integration of the Eclipse system offers a high quality direct vent fireplace system at one low price – starting at just $899 MSRP, truly the best-valued hearth system in the industry!